The past few decades has brought about dynamic changes in our ability to reduce the dependence on glasses or contact lenses for nearsightedness and astigmatism. First, was the development of radial keratotomy (known as “RK”) which we began performing in the Shore area many years ago. We have had many happy patients who no longer wear glasses. Presently, lasers are the primary tool used in refractive surgery. Modern laser vision correction is performed with the use of a highly advanced laser known as an excimer laser. Procedures such as LASIK, LASEK, epi-LASIK, PRK, and Advanced Surface Treatment or Ablation all utilize this type of laser. It is now available for many patients who could not previously be corrected by RK. This in­cludes many nearsighted patients, especially the younger ones who have higher levels of nearsightedness. These techniques are performed on an outpatient basis, and the results have been very gratifying. More recently with improved enhancements in laser technology, nearsightedness, both lower and higher levels, with or without astigmatism, and some levels of farsightedness can now be cor­rected more safely and effectively than ever before. LASIK stands for Laser Assisted In situ Keratomileusis. This technique became extremely popular in the 90’s. LASIK begins by the surgeon cre­ating a very thin flap of the outer corneal membrane. This flap is created using a special instrument called a microkeratome or a femtosecond laser. After the flap is cut it remains attached at one end where it is “hinged” so that it can be folded back while the excimer laser treatment is applied to the subsurface corneal tissue. Once this is done, the flap is gently repositioned back into place where it will reattach itself in a short period of time. The primary benefit of LASIK is a fast visual restoration after surgery. Newer techniques in laser vision correction are becoming popular that differ from LASIK. 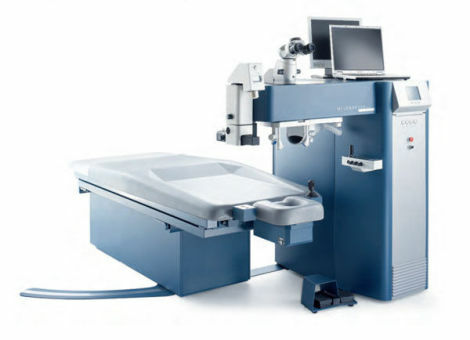 “Surface laser” are all variations of an older technique called PRK(Photorefractive keratectomy). Newer and subtle variations have been developed and have been named LASEK, epi-LASIK, or Advanced Surface Treatment or Ablation. They all involve laser treatment to the surface of the cornea without a flap resulting in certain advantages over LASIK. Many practices including ours still refer to this procedure as PRK. There are many significant advantages of PRK over LASIK. They include less risk of post-operative dryness, no risk of flap complications, and an accurate customized visual outcome. This procedure is commonly advertised as “no-touch” or “no-cut” laser. It is less invasive to the eye with no cutting involved. About 90% of LASIK complications are due to the flap. With PRK there is no flap, thus eliminating the risk by 90%. Surface laser or PRK has become the procedure of choice with many practices including ours. We invite you to ask us if you are a candidate. Take advantage of our free screening consultation. Once we determine that you are a suitable candidate for LASIK or PRK, we would then schedule you for a comprehensive medical eye examination so that we know your eyes are healthy and suitable for the procedure. If you wear contacts we ask that you refrain from contact lens wear for at least 1-2 weeks before this visit. Just imagine how you would enjoy being able to perform activities without the burden of glasses or contacts. You will first check-in and get registered at the laser center. The nurse will give you an optional oral sedative before entering the laser treatment room. You will then be lying down in a comfortable position. Your eyes will be numbed with eye drops and gently cleaned. A small device is then placed between the eyelids to help keep them open. You will be in­structed to look at a small blinking light which serves as a "target" to look at. The laser only lasts a few seconds and you will not feel it. The eyes will be rinsed with a cold solution. There is no pain involved and you will be comfortable throughout. We will provide you with written instructions for pre- and post-operative care. There is no pain with laser refractive surgery. In the past, especially with RK and PRK, patients did experience some pain. But now, with modern lasers and techniques, there is no pain during or after the procedure. Patients may experience burning, watery or irritated eyes, or some light sensitivity for a few days after surgery. This resolves over time. The procedure time takes less than 10 minutes per eye. The actual laser treatment portion takes a few seconds per eye, usually less than 60 seconds. Most of the time at the laser center is in preparation for the laser. Expect to be at the laser center for about an hour and a half. Is my vision blurry afterwards? There will be some degree of blurring and vision fluctuation afterwards. The amount of blurring varies in every patient and can last for a few days or sometimes for a few weeks. You will notice other side effects such as in­creased light sensitivity, glare, and halos around lights, especially at night. All of these will gradually improve. The final visual outcome of PRK usually takes about a month, but can take up to 6 months. When can I drive or go to work? It may be difficult to drive or work for the first few days. You will need to take 3-5 days off from work; longer if you have to drive long distances or you do a lot of near work or fine visual tasks. Do I have to take any medications or drops? You will be given instructions for both oral medications and drops to be used before and after the procedure. To ensure successful healing it is important to follow the instructions carefully. You will be on drops for a few months. You can ask for a copy of these instructions for your information. What is the recovery or healing time? Recovery time will vary in every patient. Recovery from any discomfort usually occurs within 1 week. A temporary soft contact lens is placed on the eye after treatment to help with comfort and surface healing. You will need to be cautious for the first two weeks after the procedure to avoid getting water or soap in your eyes. The surface usually heals within 2 weeks. The overall recovery from PRK mostly relates to the final visual outcome. The vision recovers over a period of a few weeks to a few months, gradually stabilizing and improving each day. Most patients recover full vision within 1 month, but it can take up to 6 months in some cases. With the current laser technology, the success rate of laser vision correction is greater than 96% and the risk very low. The risk of sight threatening complications is less than 1% overall. It is much safer now than it was even 10 years ago. As with any surgery, the doctor will discuss the risks and benefits and answer any questions you may have. Patients may experience temporary eye dryness or irritation, or difficulty with night driving vision. Long-term complications after laser vision correction are extremely rare. Please ask for a copy of the consent form to see a full list of potential complications. You must have a stable eyeglass prescription that has not changed to any significant extent in the last year. You should be at least 20 years of age or older (younger patients often have prescriptions that have not yet stabilized). The best way to find out is to come in for a free consultation. You will go through a series of tests and the doctor will exam your eyes to see if you would be an appropriate candidate. If you ordinarily wear contact lenses, in order to obtain an accurate assessment of your eyes, it is imperative that you discontinue wearing your lenses prior to this exam. Hard or gas-permeable contacts should be left out for three full weeks before the exam. Soft lenses need only be out for 1-2 weeks. Following the laser treatment the cornea will take time to heal and stabilize. After that, the effect of the laser to the cornea will not change to any significant degree. Other factors may change your vision in the future including changes in the lens or cataract formation, and problems like macular degeneration, glaucoma, or diabetes. It is important to continue with follow-up visits to check the health of your eyes. In some cases (about 1%), an enhancement laser can be performed to correct any residual myopia, hyperopia, or astigmatism if the laser did not correct all of it the first time. There is no extra fee for enhancements done within the first year after the initial laser treatment. When patients reach their 40’s, reading glasses are usually needed even after laser vision correction. In some cases, monovison can be performed to avoid reading glasses. Ask your doctor about monovision if you are aged 40 or over. If you have any further questions about laser refractive surgery you can simply call us and speak with a doctor. Or you can come in for a free consultation.